Late last week Auckland Transport provided me with some fascinating stats related that broke down rail patronage results by station. The data is for the previous financial year -so from 1 July 2013 to 30 June 2014 – and covers 10.05 million trips out of the 11.44 million that took place. The difference between the two figures is primarily made up of special event patronage and legacy tickets still in use such as child monthly passes. Perhaps the best thing about the data though is that for the first time we can see how many people travelled from each station to each other station on the network. Getting this kind of information is one of the reasons that having customers not just tag on but also tag off with HOP is so useful. In this post I’m just going to scratch the surface of what insights the data provides so please feel free to dig deeper into it and it would be great to see what kind of interesting visualisations you can come up with (and if you do please share them on here first). To start with here is a map Kent has put together showing all boardings by station. The data behind that is in the table below along with the number of people alighting at each station. There are a couple of things I notice straight away from the data. There are a hell of a lot of people not tagging off with 5.5% failing to do so. Of course we don’t know where this is happening but I would assume that apart from Britomart and Newmarket which have gates, that it’s fairly proportionate across the network. There has been a big surge in use of Henderson. In all previous figures that we’ve seen including the ones up to March this year Henderson has been around 8th to 11th busiest station based on the number of boardings and was 11th in that earlier data. It has now shot up to become the 4th busiest station which is a massive jump and could be one of the big reasons behind the rise in patronage we’ve seen on the Western line. Interestingly it hasn’t had the same sort of increase in people alighting (unless they make up a lot of the unknowns). 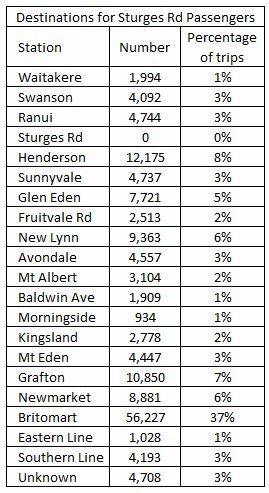 Manukau has been the biggest mover after Henderson which has gone from 34th at the end of March to 38th. Panmure is also continuing to climb the station rankings and I’ve heard suggestions that some month’s patronage has been more than double the same month in 2013. The bottom three stations are unchanged although the exact order has shifted slightly. All three combined make up just 0.9% of all patronage. We know Waitakere is set to close once the Western Line is electrified and AT in the past have suggested closing both Westfield and Te Mahia, both of which were being decided on at the AT Board meeting yesterday. Britomart dominates patronage but not as much as you would think. Trips to and from Britomart make up just 55% of all patronage which is less than most people would probably think. The results get more interesting when you start to look at where people are travelling to and from. As an example for my local station – Sturges Rd – I can see just 37% of people boarding a train there go to Britomart. The two graphs below show the boarding and alighting at each station on a trip towards Britomart (Newmarket boardings are not included). In the Western Line graph below it highlights that for Western Line passengers, Grafton has now edged out Newmarket as the second most important destination. For the Western line just 40% of people onboard a train bound for Britomart travel all the way. 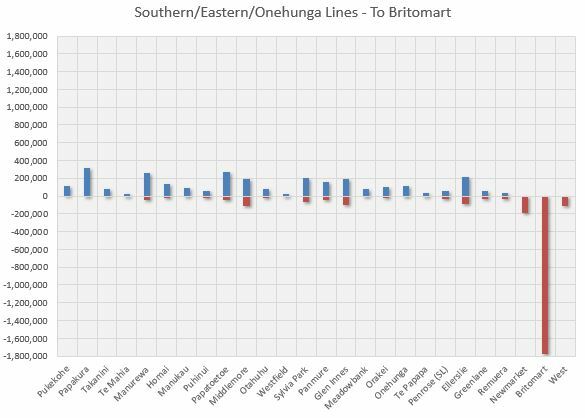 The profile of the Southern/Eastern lines is quite a bit different with Britomart dominating more and taking 67% of all the trips for trains heading towards the city. It’s fantastic to final get this level of detail and I look forward to when we’ll be able to see it on a regular basis plus see it for at least the Busway stations too. As mentioned above it would be neat to see what visualisations of the data you can come up with. The data is here. Interesting about britomart. Think manukau and panmure massively undertapped yet need the bus network up ie these have planned RTN and dont even have a bus lane yet.Probably could say that about most stations. The bus station data will also be good to start tracking especially when priority measures start to roll out. From observations recently Manukau would be even busier than what those figures above indicate. I have also observed from Manukau the patterns of passenger movement from Manukau since the new timetable has given 20 and 30min frequencies. The bulk of the passengers are now going Manukau to Manurewa and Papakura by train rather than bus. Problem and constant complaint I hear? Transfer at Puhinui rather than going direct which would probably increase the patronage even further. These figures end in June, so wont take into account the new timetable and electrification of the Manukau line. I’m sure Manukau will climb even further in coming months, especially when the campus year starts and the bus station opens. Will sky rocket. I really wander why there isn’t bus lanes on pakuranga highway when this is supposedly the next highest RTN priority? I understand pinch point at panmure bridge but dont understand elsewhere, why not go panmure to howick right now and start turning the balance. Even To Rakau drive to botany why not at least a T3 right now? CRL still doesn’t solve the main problem for trains going from west to Newmarket/Grafton – having to reverse into Newmarket station and watch the driver get out and trudge down the platform with his lunchbox to the other end of the train to take it to Britomart. Minutes wasted right there. This data only confirms my suspicions that the CRL won’t do much of anything for the large amount of people using the train to go that way who won’t be interested in taking a major diversion through the inner city. Sorry Len. Oh Mr Skeptic, your understanding of the CRL poor, and your history is worse. 2. The CRL was not dreamed up by Len Brown, it is not for him, or any one politician or person. It is for every Aucklander, Especially road-only users as will so transform the whole PT option that it will accelerate the current exceptional growth in PT that it will significantly improve the efficiency of truck, bus, and car trips too. Wrong on both counts according to ATs plan. The CRL means trains stop reversing at Newmarket, and it includes a direct west to South line. Surely you should know this by now? They should know, but the scepticism of guys like this will outlive religion. Its ideological. Just a question, any idea how they will show trains on the PIDS on that red-line as it runs back on itself, so you will get a train at Manakau that says Papakura on the PIDS, but it will take a very long time to get there unless you transfer at Puhinui, which will confuse some people and vice versa those going from Papakura to Manakau. Perhaps they will just say Britomart on the Papakura service upto Britomart and then change its name to Manakau for the PIDS past Britomart, but then what if you intend to go to Orakei from say… Aotea, you would have to catch the “Britomart” and avoid the “Onehunga”. Bit confusing. The performance of Grafton is almost certainly a function of absence of the CRL. Which is to say that to get anywhere in the city the Western Line is hardly direct or fast. Downhilling from Grafton is an observed phenomenon, as it speeds many travellers’ trips if heading uptown, midtown, or to the Unis. Although there are good and growing attractors at Grafton too; Med School, new AK UNi campus, and the Hospital especially. Post CRL Grafton will be on the Southern Line and will continue to perform strongly, though will there is likely to be a drop in people using it to access the city as staying on the train is likely to be more convenient for most. I’m going to put my hand up on the forgetting to tag off HOP thing – my fail ratio is a lot higher than 5%, although I’m a fairly infrequent user of buses and don’t use the trains. I have found that the only way to reliably remember to tag off (especially when new to the system) is to hold the card in my hand for the duration of the trip. Then when I go to get off, I’m prompted by the “what’s this thing in my hand!” oh right tag it. If you put it back in your pocket, wallet or bag it’s really difficult to create the habit. Me too. Why do some stations, like Remuera have their Hop readers tucked away to the side -and out of sight? Why weren’t they installed in the blindingly obvious location – at the entrance ramp!? I’ve probably spent $100 in fines due to this. If you’ve forgotten THAT many times at what is your regular station, then I would suggest it wouldn’t matter where the readers were……..
About 5% of the population have some level of clinical AD/HD. Even a simple “Have you remembered to Tag off” sign would be nice. Fines? I’ve never seen anyone enforce fines or are you referring to the tag-off failure penalty? I’ve always thought they should be placed next to the signs that display the station’s name. Giving them a universal location would make things a bit easier. My problem is that i keep putting the card in a pocket after tagging off and because i don’t travel everyday the card can end up at home, with me ready to board again. My solution has been two cards. With the second held in my wallet and with a minimal balance, for just in case. Just tag on and off with your wallet, there’s no need to remove your card to do so. Depending on size you could even slip it into your phone case (provided you use one). Many people, including myself, have several NFC cards in their wallet. I have my Amex, Mastercard and AT HOP card which all conflict with each other if I try and tag on with all three in the wallet. So I have to take out my AT HOP card in order to use it. With many people now using NFC credit cards I think this is a common issue. 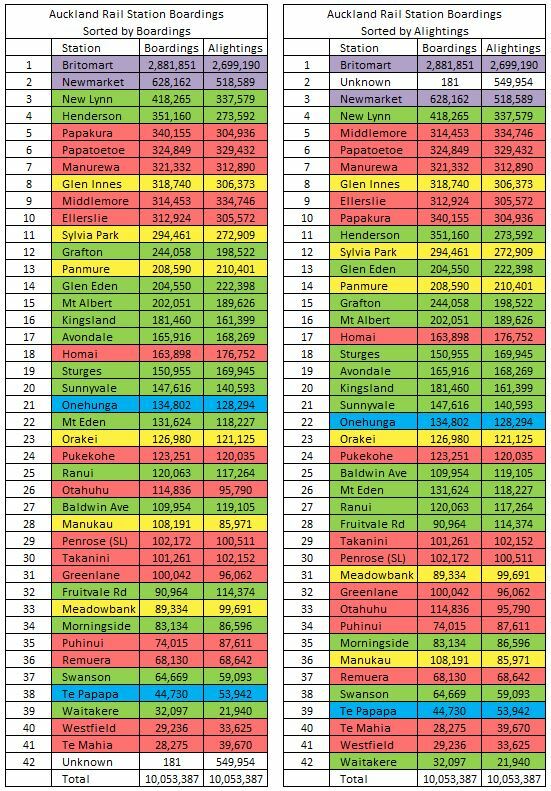 It would be interesting to see where Pukekohe ranked if the numbers were adjusted to account for the fact the Pukekohe is one of the very few stations that had no trains during the weekends for the entirety of this period. The buses I understand issue with routes changing so no the 1000 buses are no good to us yet.Some bus stops and interchanges missing. I just don’t think we have fully realised what a network repriorisation will do and the opportunity cost to all modes including rail of not having a bus fleet unrestricted by traffic constraints especially when the road width is already there in most cases.I would love to open the tap to free flow but we need buses to use it. The privatisation of buses has really done some serious damage to Auckland from what I can see. I’m not clued up with the new bus contracts. Even if AT doesn’t own the buses a team needs to run the network 24/7 and make changes at will. With the economic cost of congestion and the high potential to unclog the network partnering with rail even a hire on day works and firing up circuit by circuit better than the wait till 2016 approach. So panmure interchange is ready right now. I know AMETI going on but not the whole way why not fire up a bus lane using white painted symbols every 50m up Pakuranga highway which has 6 or more lanes. Isn’t this the intention open up this PT wasteland on NZ busiest urban rd. It even got a BC from NZTA or was that for the flyover? Is it possible the break this into weekdays vs weekends? Curious to see if britomart grows/shrinks or stays the same for both cases, and how much it’s being used for ‘casual/social/personal’ (ie weekends) vs commuting on weekdays. Not with the data I was given but yes AT could break it down if they wanted to. A minor thing, maybe Kent can comment, but I *think* the map circle areas overstate differences by about double. E.g the area of the Britomart circle is about 20 times the area of Grafton’s, but it has 10 times the boardings. I thought about the exact representation of the circle areas to boardings but didn’t have time to figure it out. Perhaps there is a more specific class to use? Oh, and now remember I’m using % of total boardings to roughly size the circles. You’ll need to take the square root of the % to ensure the area is proportionally correct. 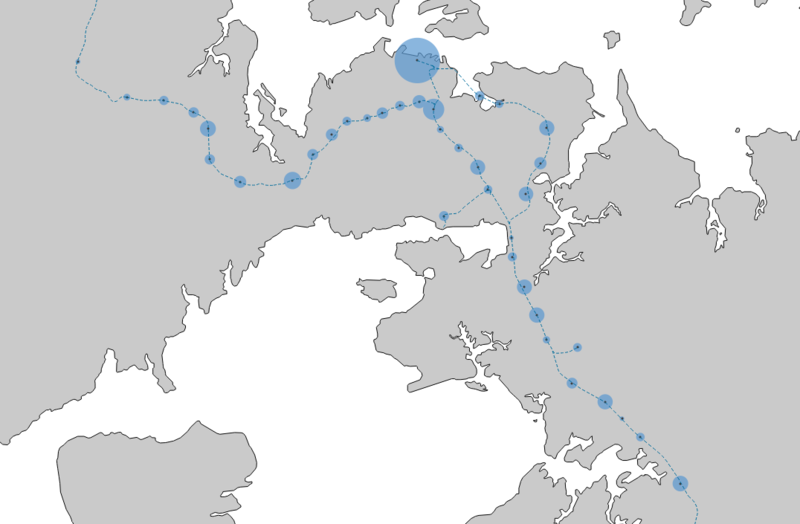 AFAIK you can’t do this in the cartocss tho, you’d need to pre-calculate. 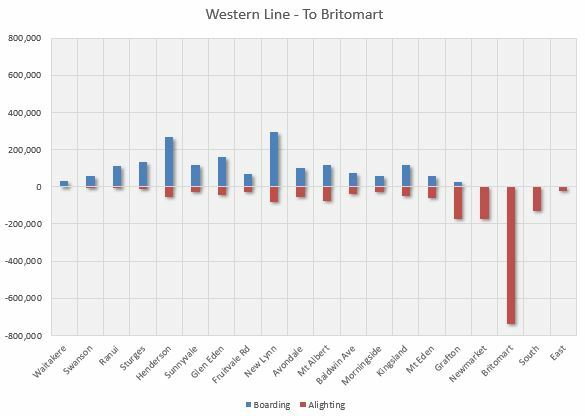 This helps show the relationship between britomart and the smaller stations in a much fairer light. We were told by AT or should I say mislead that the reason there were no ticketing gates across the entire network except Britomart and Newmarket was because these were the stations that “70 per cent of rail trips would begin or end at either of the two gated stations”. I tend to remember 80% being thrown around at some point. I knew this to be wrong from the outset and the real reason the system was not done properly was cost. Now as stated here “For the Western line just 40% of people onboard a train bound for Britomart travel all the way” and this is exactly what I see, a lot of passengers boarding and getting off at stations without gates and no need to pay. That is a sizeable hole in the revenue net that we weren’t told about and what I would like to know is when is this fare sieve going to be fixed? And the current thin scattering of ticket inspectors is not the solution. Are the Manukau gates active and in use yet? They’ve been in use since the opening of the MIT campus back in July. The Britomart stat – 55% – is a stunning one. How do the anti-CRL “its only about the CBD spin that one? And that stat will only go down further with things such as growth at Manakau and electrics on the western line. Surely you must have realised that facts and evidence are irrelevant to these people. You may as well present facts about evolution to a fanatical creationist. Their opposition is based on ideology and the false impressions they have from listening to people like Cameron “Never had an original idea in my life” Brewer. Much easier than actually thinking and reading the articles with all the big words.